I had the chance to visit winemaker/owner Adam Godlee Campbell at Elk Cove Vineyards following the Wine Bloggers’ Conference in August to talk to him about his stylishly made Pinot Noir, Pinot Gris and Pinot Blancs. 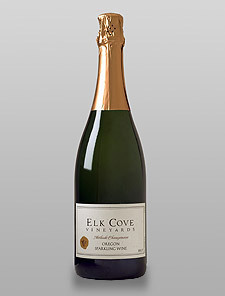 Elk Cove Vineyards is family owned and operated, started by Pat and Joe Campbell in 1974. 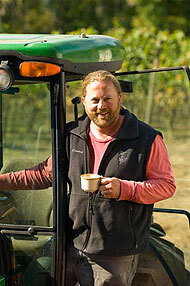 Adam, their son, took over in 1995 to manage the winery and make the wines. Adam explained to me that the name Elk Cove came from a time when they had first moved up to land and found a herd of Roosevelt Elk which roamed nearby, and migrated into the valley each spring. The winery was established in 1974, their first vintage came out in 1979. They are currently creating single estate wines from five separate sites throughout the Northern Willamette Valley. Windhill, La Bohème, Roosevelt, Mount Richmond and most recently Five Mountain Vineyards were have all been selected for specific site characteristics for their Pinot Noirs based on soil, aspect, and micro-climate. The vineyard uses sustainable agriculture practices and all the fruit is hand harvested. Adam led us though a tasting of nearly all their wines, we even had the chance to try their limited edition 1999 Sparkling Willamette Valley wine, their carbonic maceration Old School Pinot Noir, as well as finish with their 2008 Ultima-White Willamette Valley ice wine. If you get a chance, you have to try their 2011 Pinot Gris Willamette Valley and their 2009 or 2010 Pinot Noir Roosevelt, these were two of my personal favorites! They have a beautiful winery set on a hilltop in Gaston, Oregon that has incredible views and beautiful scenery. If you are in the area, you can visit them at 27751 NW Olson Road in Gaston, OR 97119 or visit them at http://www.elkcove.com for more information. Special thanks to Adam for showing us around and allowing us to taste his great wines. Cheers! 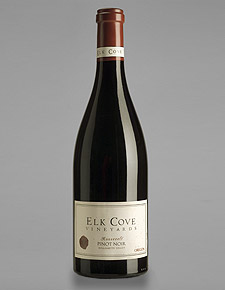 This entry was posted in Oregon Experiences, Understanding Winemaking, Wine Tasting in Oregon, Winery Visits in Oregon and tagged Elk Cove Vineyards, Joe Campbell, Oregon Experiences, Pinot Gris, Pinot noir, Roosevelt Elk, Willamette Valley Vineyards, Wine. Bookmark the permalink.